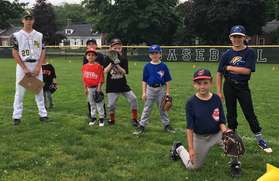 Benevento Fields were filled with young ballplayers and fans from Friday night to Sunday afternoon as the 2019 North Reading Little League season got underway on April 12-14. 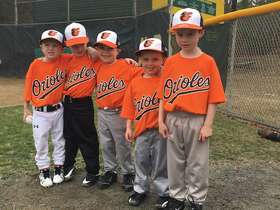 Among the many teams in action were the Tee-Ball Orioles (pictured above). Most teams will be in action through Spring Break week as well. Play Ball! North Reading Little League is accepting applications through May 4 for the two $500 scholarships – The Phil Dardeno President's Award and the the Harold B. Reynolds Memorial Scholarship – it annually offers to graduating North Reading High School seniors. Learn more about the requirements and download the application using the "Scholarship Opportunities" link on the left side of our home page. This spring, North Reading Little League is presenting a tremendous opportunity for 12- and 13-year-old ballplayers to build their skills for the Big Diamond. NRLL is planning to field a team in a Sunday afternoon 50/70 baseball league at Stoneham High School. The intermediate-sized field is bigger than the small diamond (46-foot pitching mound/60-foot base paths) that 12-year-olds play on in Majors, yet smaller than the traditional big diamond (60/90) used by those ages 13-and-over. There are benefits to all players who participate. For 12s, it will introduce them to a bigger field with more baseball-like rules; for 13s, it opens an opportunity to compete for a position on a North Reading 50/70 Williamsport (All-Star) Team. All 12s and 13s registered for the 2019 NRLL spring season are eligible to play, and the 10-game schedule is being made so it doesn’t conflict with the Majors or MBDL schedules. And the best part? There is no additional cost to play. If you're interested being part of North Reading’s 50/70 team this spring, please contact your Majors or MBDL coach ASAP or email NRLL Player Agent Ed Cady at edcady@comcast.net. Practice makes perfect, and combining practice with fun makes for a perfect morning of baseball. That’s the spirit of Varsity Day, when the North Reading High School baseball team will welcome North Reading Little League players to NRHS’s Carey Park to teach the finer points of the game in a relaxed and encouraging environment. This year’s event is scheduled for Saturday, April 27. From 10-11:30 a.m. that day, Hornets players and coaches will conduct a clinic open to NRLL players of all ages – from Tee-Ball through Senior League – that will include instruction, contests, and a pep talk from varsity head coach Eric Archambault. There will be hitting, pitching, fielding, and throwing stations, followed by complimentary snacks and drinks for players and their parents. NRLL players are not required to register for the event, but are encouraged to coordinate attendance through their coaches and teammates. The time was purposely selected to avoid conflicts with Little League games that afternoon. “Over the past few years, we have seen Varsity Day grow into another great North Reading baseball tradition,” Archambault said. “It’s a day that, as a program, we really look forward to – the opportunity to teach and engage the town’s youth players in a fun, positive way. “What makes this event so special is that our varsity players can see a bit of themselves in these youngsters,” he added. Since its debut in 2016, Varsity Day has become a staple on the North Reading Little League calendar as well. “We saw right away how much the younger kids enjoyed being around and learning from the high school players. It had such a positive effect on them,” NRLL president Eddie Madden said. “And last year, when we opened up Varsity Day to all levels of NRLL, the response was outstanding. More information is available at www.nrll.org, North Reading Little League’s official website.